Your choice of safari operators largely determines the success or failure of your safari trip. Safari companies are unfortunately not all created equal. Choosing the wrong one for your once in a lifetime safari trip can have disastrous consequences. So what can you do to avoid the "cowboy" companies and still get value for your safari money? Get advice and recommendations from someone who has been on safari with the company you are interested in already. Book with reputable safari operators to avoid the "fly-by-nighters". Don't skimp on price. Generally, most of the risky safari companies are to be found in the below budget category because they need to cut corners to maintain the extremely low prices. Stick to the rates categories and you should be ok. I've set up a list of the Top Three Safari Operators in several African countries that conforms closely to all the right criteria. I have an advantage being the founder of African Safari Journals as I get to read all the safari trip reports that Africa travellers send through when they get back home from their journey. It quickly becomes clear who the good safari operators are and who the ones are that you should rather avoid. "Once in Africa, I found out that the African Safari Club employees had not been paid for between 5 month and 7 months. Had I known this, I certainly would not have booked with the company. The safari vehicles were inferior to everyone else's, tyres being threadbare and seats all ripped and torn. On the safari itself, I understood we were to travel in convoy as there had been trouble with bandits in the past. All the other companies had a shotgun guard, we had none. With the tyres in such a bad state and difficult terrain, it's not surprising that we had three punctures and the so called convoy deserted us. We were left stranded in the middle of nowhere. Once back at my hotel I personally witnessed a peaceful demonstration by 48 ASC workers asking for the right to be paid. And the outcome - they were all promptly sacked." BEWARE - Although this particular safari company has fortunately since closed down, there are still others like this out there. What Does the Top Three Safari Operators List Contain? The list ranks the Top Three Safari Companies in Kenya, Tanzania, South Africa, Botswana, Namibia, Zambia, Uganda, Rwanda and for climbing Kilimanjaro. It's based on the recommendations and experiences of former safari travellers and reputations built up in the travel industry and compiled by yours truly, Bruce Whittaker (more about me), the founder of African Safari Journals. You can use the list to very effectively and quickly sift through the large amount of safari operators that exist in each country to find the cream of the crop. Out Of This World: Prices range from $650 upwards per person per night spent on safari. Luxury: Between $350 and $650 per person per night spent on safari. Standard (camping where applicable): Up to $350 per person per night spent on safari. 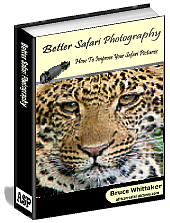 A Free Safari Photography e-Book - Get your copy of the 41 page "Better Safari Photography" e-book at no charge which pinpoints exactly what you need to know and do before, during and after your safari trip to improve your safari photography results whether you are a novice, intermediate or advanced photographer. Safari Packing List - Detailed list covering exactly what you need to pack for a safari to make sure you stay within reasonable weight limits and not leave anything important behind. Valuable Safari Tips - What you must know before you go. Obtained from thousands of trip reviews and years of personal experience. A Wildlife Ticklist - A list of the animals you are most likely to see on your safari. Tick them off as the sightings happen.